Gains of 15 WHP and 20 FT/LBS of Torque – this is per Milltek’s website and I think this is probably in combination with their catless downpipes. I haven’t dyno tested my car strictly for the impact of the exhaust, although I’m inclined to believe it certainly has some performance improvement on its own due to the addition of the H-Pipe from the OEM deisgn which improves airflow and should lead to some decent gains. Almost too quiet – I’d say it’s maybe 25% louder than OEM at full throttle and probably 0-10% louder at cruising speeds and idle. That can be a good thing if you want a relatively tame exhaust, or a bad thing if you want to hear the V8 growl. Personally I have a short commute and wish I had something a little louder, thus my plans to switch it up. 2.25″ Piping – the exhaust itself is still 2.25″ diameter piping, which is the same as OEM. Most other aftermarket exhausts are 2.5″ diameter such as STaSIS, JHM/Fast Intentions, etc., and the larger diameter improves performance and airflow (not to mention louder sound). While the difference is probably only a few HP at most, the difference in diameter is something to consider. H-Pipe versus X-Pipe – There are various pros & cons to H-pipe versus X-pipe design, and I wouldn’t necessarily say an H-pipe is a bad thing, but the general consensus for the B6/B7 S4 is that the X-pipe will give slightly more power, whereas the H-pipe gives a different exhaust note that some may or may not prefer over X-pipes. Ultimately picking an exhaust is a personal decision, much like selling your car or even your taste in music – do you like how it sounds? Does it fit your driving needs? Are you more concerned about performance or do you want something more subtle? Do you have family, and if so will they complain incessantly about your exhaust being too loud, thus causing you to regret your decision? Is it Too Quiet, or Just Right? Most (well built, reputable) exhausts will have at least some performance gains associated with them, so the primary rationale (IMO) for buying one exhaust over another for these cars should be based on the sound. I made the video above using my GoPro camera to try to capture the sound, but it’s really hard to do it justice without hearing it in person. The Milltek Resonated exhaust sure is quiet. On one hand I wish it were louder for weekend cruises, track days, etc., but for a daily driver, having a refined & subtle exhaust note is nice. Likewise for road trips and highway commuting, it’s great that the exhaust has no drone and bothers no one, including my wife and easily-frightened dog. After hearing many different exhausts combinations for the B7 S4,I’ve heard quite a few that were undoubtedly too loud for my driving style – while they sound great at meets, I think it’d be too much for daily driving. Your downpipe choice will also have a large effect on this, as 2.5″ catless downpipes are going to produce much more noise than 2.25″ Piggie Pipes with pre-cats only gutted such as I have. My plan for now is to pickup a STaSIS exhaust – I’ve heard it before on a car with Piggie Pipes, and to me it was the right amount of loud and contained minimal if any drone. It also has 2.5″ piping and an X-pipe, so I’m hopeful there are some small performance improvements on top of the enhanced exhaust note. I also considered the JHM/Fast Intentions exhausts – I get the sense they are very well made, and probably yield the greatest performance increases based on their dyno charts & technical specs, but all of the videos and reviews I’ve heard/read have left me to think I wouldn’t be happy with the sound – the non-resonated is too loud, and the resonated versions have a tendency to drone quite a bit. The final factor in the exhaust choice is price. I purchased my Milltek exhaust used for a great deal, which is why I went with it initially. It retails for about $1400 which is comparable to the MSRP of the JHM/Fast Intentions and STaSIS setups. There was recently a closeout sale on the STaSIS systems for $900 each, which forced my hand to try something new as I’d be contemplating this a while. I haven’t seen the JHM exhausts go on sale very often or for much of a discount, and from what I can tell they’re actually in high enough of demand that often times there is a few week wait to get an exhaust built/shipped to the buyer. Milltek exhaust systems seem to be fairly readily available, although I don’t see them on-sale very often either. I’d love to know what exhausts readers of this blog are running and what they think of their various setups. Be sure to note your downpipe setup too, as that may be relevant to drone and/or excessive noise complaints (or lackthereof). Leave me some comments with your 2c! Just curious, do you have any other reviews coming up? Sup Nick, I’m thinking of going the other way. I currently have the STaSIS exhaust with stock downpipes and the exhaust tips baffles removed (Challenge edition). I like the deep note that STaSIS provides, but I’ve outgrown it and want a meaner rumble, so now I’m considering replacing it with the non-resonated Milltek exhaust. If only the Milltek Valvesonic exhaust would come to market soon…gonna need a buyer for my STaSIS. Thanks for the review of MIltek. 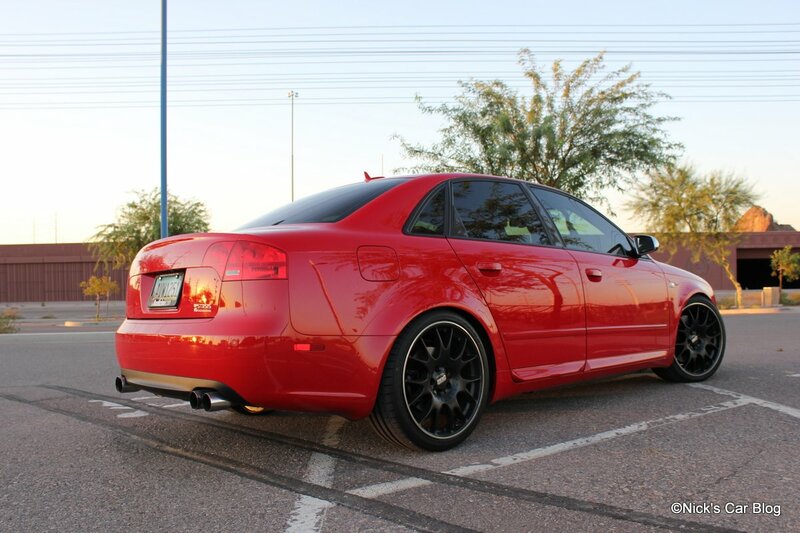 I rarely get to hear an after market exhaust on an S4 in person, but recently did hear a STaSIS. No ideas if res or non-res. It sounded great, but too loud for my tastes, but glad you found what you liked. Thanks for the op on FI, this is about what I’ve noticed in my research as well, and so clarified that it is probably not for me. I’m looking for slightly above OEM, no drone, euro sound and good performance. Too bad you can’t get that Miltek res mellow refined euro sound in a 2.5 x pipe. I like the Milltek sounds both Non res and res but i’m deciding between finding something thats not ricer loud and not stock OEM quiet. I just want something where its almost stock on startup and then when I step on it, it will open up. I don’t plan on doing any mods to get after market DP or even gut them for the piggies so does that mean I should go with the non res? I’ve listened to countless videos but they can only do so much through speakers. Anything after market won’t throw a code or anything right? Hey nick love the blog I’ve read over your reviews atleast 10 time each lol. On my s4 b7 I have a flowmaster super 10 installed in the middle of the exhaust and a xpipe 11 inches before it (it’s got that raspy growl like you listening to your exhaust in a tunnel) and performance was 4awhp that’s on a dyno at my local shop here in nc. It’s quite loud on acceleration but not to loud at cruise but enough to know u got a v8 under the hood. I thought I’d share my exhaust setup. I’m putting catless dp’s next week I’ll post a link to the sound clip. Anyways nick take care!! Awesome, nice work Jacob! The flowmaster mufflers (ditto Magnaflow) are great if you go the custom route, and definitely a much cheaper way than a lot of the full catback systems like Milltek, etc. out there. Glad you found a setup you like! I posted a couple of years ago regarding a possible Miltek exhaust. My car is an Avant with tip and as you probably know, they are the most prone to droning. I wanted to retain some sleeper aspects of stock while giving it more attitude, performance and pave the way for future mods. I have now done a full exhaust with Fast Intentions hi-flow cat downpipes and Miltek resonated catbacks. I couldn’t be happier with the results. No drone with this setup, some noticeable performance gain, though more in HP than in torque and the sound is just what I wanted: a nice deep and subtle rumble at idle, a fly under the radar sound at low RPM and an assertive deep v8 growl at higher RPM. While I left some performance potential on the table with a 2.25″ H pipe catback, most of the performance gain is in the downpipes anyway, so a good compromise IMO. Any by the way my fuel economy has gone up by 2 MPG! Anyway, just passing on my experience. Awesome, glad you found a setup you like! I enjoy my 2007 S4 Avant. I would like to have a better sound (growl) during acceleration but not at crusing speed. I have a Carbonio air intake which helps and i am thinking just the Milltek Hi-Flow cat &downpipe. Can you give me your feedback on this. I doubt there will much of a difference between the hi flow Miltek and the hi flow Fast Intention Down Pipes on mine: quiet at cruise, low rumble at idle, but does have a nice growl on acceleration. No drone, raspiness, etc.